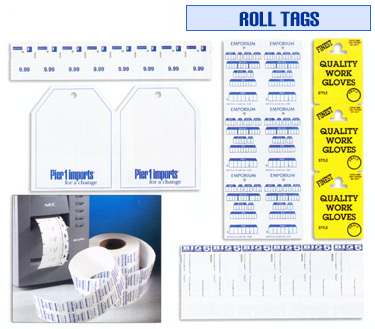 Roll Tags are available in a variety of shapes and sizes and can have special punches to fit your business needs. Thermal Transfer Tag is a white tag stock specifically designed to run through a thermal transfer printer. It is an excellent surface for primary graphics, and provides superior high density bar code printability. Hundreds of sizes are available for Roll Tags.